Wouldn’t it be nice if we could measure the amount of bacteria and hydration levels in our mouths to prevent bad breath and unnecessary trips to the dentist? Well, there’s about to be an app for that. On a 2013 episode of ABC’s Shark Tank, all of the judges decided to invest $1 million in a smartphone app from the company Breathometer. Breeze is the company’s breathalyzer product that works with your smartphone to provide accurate measurements of the body’s blood-alcohol levels. It also gives you estimates on when you’ll be completely sober — or back to zero as they call it — and helps you find food, hotels, and Ubers around you. 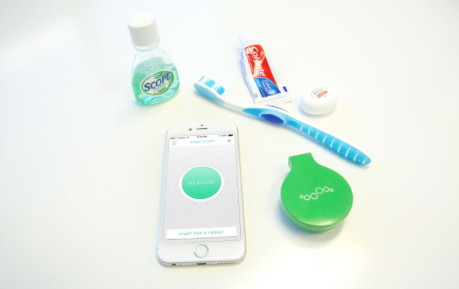 Now they’re taking the same technology of Breeze and putting it into Mint, a similar product that works with your smartphone to provide accurate measurements of the bacteria in your mouth. The minds at Breathometer know that oral hygiene isn’t just important to your teeth and gums, it’s important to your overall health and well-being. In addition to bad breath and cavities, poor oral hygiene has been linked to diabetes, gum disease, heart disease, and even oral cancer. They also know that proper hydration is vital to many things: your energy, skin, hair, organs, and metabolism, among many others. Breathometer’s Mint is the first portable breath quality and hydration level detection product. It automatically draws a sample of the air in your mouth and the app lets you know the quality of your breath and how hydrated you are. It measures the sulfuric compounds in your mouth that lead to bad breath and tooth decay as well as the moisture levels of your mucus membranes. 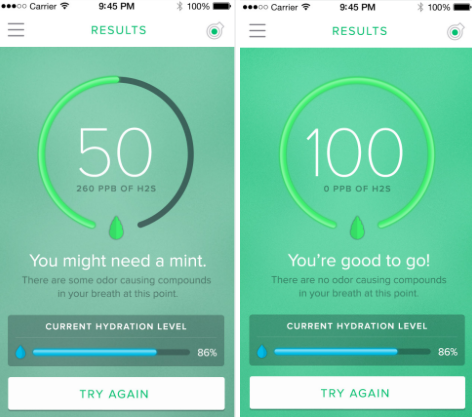 The app will give you personal recommendations on how to improve your hydration levels and overall oral health and even allows you to export this data and share it with who you want — your dentists, hygienists, personal trainers, even Facebook friends if you want to brag about your fresh, hydrated mouth. The creator of Breathometer, Charles Michael Yim, recognized that there were all sorts of ultrasonic toothbrushes and new flossing products on the market but nothing in terms of a portable product that can tell you whether or not your brushing, flossing and hydration methods are efficient. He believes that Mint will change that. We’re excited to see where this technology will go. Anything that will help our patients improve their oral health regimen is fine by us! Call to make an appointment today — we even offer free exams and X-rays for new patients!